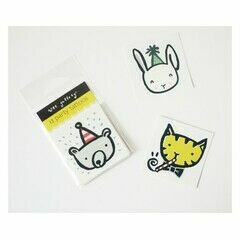 Our range of temporary tattoos and face paints make great birthday party favours or stocking fillers! All the tattoos in this section come with intricately charming and detailed designs to capture any party theme or dressing up idea you have in mind. We've also made sure that every temporary tattoo and facepaint set has been dermatologically tested for safety and is easy to apply.